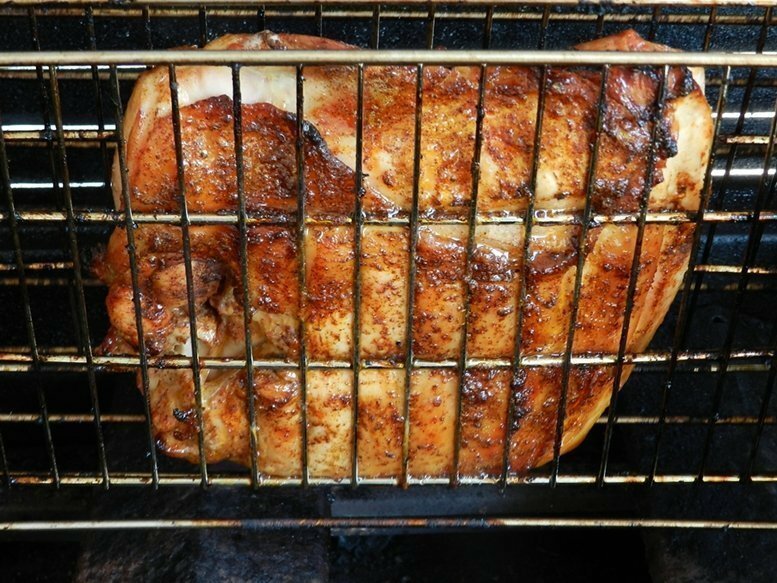 Here are a few rotisserie grilling tips to maximize your enjoyment of your new toy. Once you have your new rotisserie in place the fun begins. 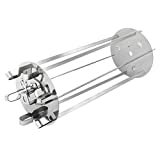 The placement of your spit rod bushing is very important to your rotisseries performance. You want everything to rotate as freely as possible. In order to achieve this slide the bushing onto the rod. Place the rod into the rotisserie motor as far as it will go then pull it out slightly. Half an inch should do it. Most rotisserie motors stop the rod with the back of the case. This small step will minimize your drag. Now, set the spit rod bushing into place and tighten. Once you have it in position there is no real reason that it would need to be removed. Because, you will be sliding the meat off of the pointed end of the rod. Onto the spit rod and forks before each use. This will help to minimize your cleanup. I will also coat the groove of the spit rod bushing to minimize friction. Create a starter hole in the center of the meat with a steak knife. Use as much of the blade as possible. Cut it twice creating an X this will allow your rod to start into the meat straight easily. Set the position of the first spit fork on the rod. Before sliding the meat and second spit fork on. That way you will not have to slide the entire set up back and forth to get the position right. Place the second fork in firmly penetrate the meat without squeezing it. When rotisserie grilling poultry check that the bird is well trussed. When your bird starts flopping around stop the rotisserie and re-tie it. I will use these silicone rubber bands instead of butchers twine when I am feeling lazy. Rotisserie grilling tip: Rotisserie grilling should always be done use indirect heat. An infared rotisserie burner is actually an indirect heat source. Using a drip pan that is the appropriate size for your food will minimize the risk of flare-ups while allowing for good heat circulation. Adding some water or beer to the drip pan will also help keep your food juicy. Cleaning your spit rod and forks should never be done with abrasive cleaners. 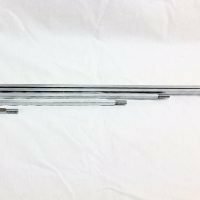 These parts are typically chrome plated and abrasives will scratch the plating and that will eventually lead to the plating flaking off. Insulated food gloves are nice to have. 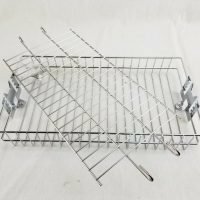 Use them to place the food onto and remove hot food from the spit. 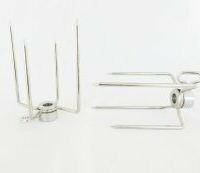 Thumbscrews of the spit forks can be tightened and loosened with a standard kitchen fork. When not in use I store all of my rotisserie parts in a large Ziploc bag so they will not get misplaced. For our approximate rotisserie cooking time chart click here. A counter weight sometimes called a counter balance is used on a rotisserie when the load is off-balance (heavy on one side). An off-balanced load will cause your rotisserie motor to speed up and slow down while turning and cause uneven cooking. 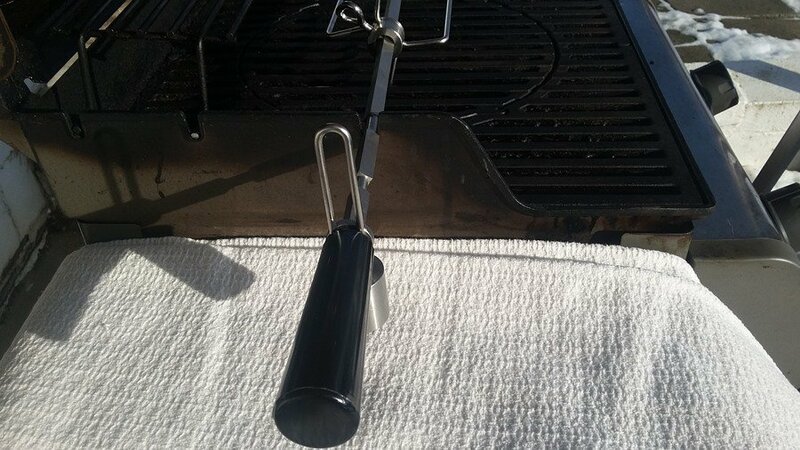 Always attempt to balance your load before cooking, just center the food on the spit rod as best you can. 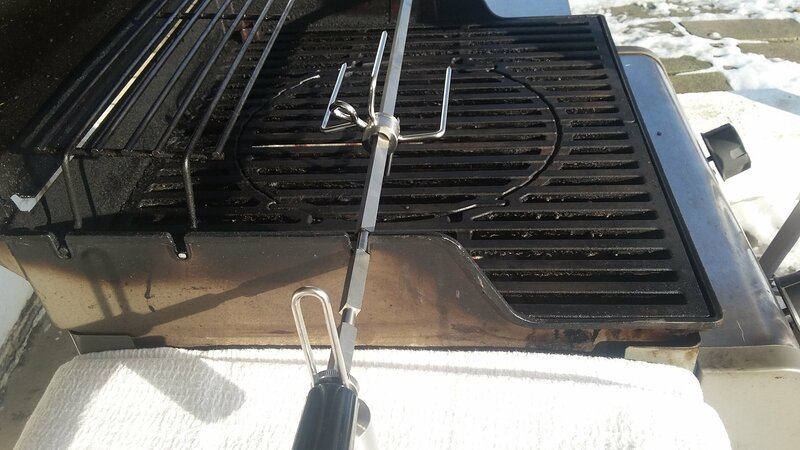 To determine if your load is in balance, set the rod in the notches of the grill, but not in the motor. When it is off-balance the heavy side will roll to the bottom. Rotate the rod a quarter turn and let it go again to double-check and repeat. If the meat does not roll down you have a balanced load. When it does roll, you will need the counter weight. Leave the rod on the grill for adjusting. To adjust your counter weight. Start the weight side closest to the rod opposite the heavy side of the rod and tighten. In this position this is the lowest setting. Turn the rod in quarter turns like in the previous step to see if you still have a heavy side. When the load is still off balance, loosen weight and slide the weight further away from the rod and tighten. Check the balance again. Repeat these steps as needed to get the load in balance. Do you have any handy rotisserie grilling tips? Leave them in the comment section below. The placement of your spit rod bushing is very important to your rotisseries performance. You want everything to rotate as freely as possible. In order to achieve this slide the bushing onto the rod, place the rod into the rotisserie motor as far as it will go then pull it out slightly, a half an inch should do it.